Shovel your walk or else. 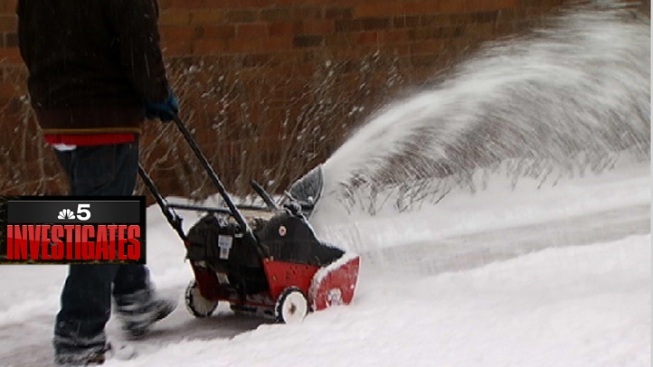 That's the message from the City of Chicago, which warns that residents face $50 fines if they fail to clear their sidewalks. Businesses can be cited for up to $500 per day. But an analysis by NBC5 Investigates finds that almost no one actually pays. Out of 1,669 complaints at 1,411 addresses citywide, only 72 tickets were actually written. Of those, only four had been the targets of complaints phoned into the city's 311 operators. And some of the tickets led to an adjudicated fine of "zero dollars". Breeze through the complaints list, and the overwhelming majority are for single family homes and apartment buildings, save for the occasional Wal-Mart or Home Depot store. Three of the addresses had seven complaints apiece. Guidelines published by the City of Chicago's Department of Transportation quote the Municipal Code, warning that "Every owner, lessee, tenant, occupant, or other person having charge of any building or lot of ground abutting upon any public way or public space shall remove the snow and ice from the sidewalk." Residents and businesses alike are reminded that "we are all pedestrians and benefit from having a safe, clear, and continuous path to travel." The rules state that if the snow stops falling before 4 pm, residents have just three hours to clear their sidewalks (except on Sundays). If the snowfall stops after 4 pm, or on Sunday, the walks are to be cleared by 10 am the next day. "What happens if I don't clear my sidewalks?" the guidelines ask. The answer appears ominous: "Individuals who do not comply ... can face fines of $50. Businesses who do not comply with the sidewalk snow removal ordinance can face fines from $250 to $500 per day of violation." But it rarely happens. Data provided by the City shows no business received a fine of more than $50. That includes an Aldi food store on West Cermak which received only a fine of only $50 for two tickets, and the Alliance Holiness Church on N. Kimball which also received a $50 fine. Chicago Parking Meter on South Michigan Avenue was ticketed seven times, but paid no fines at all. None of this, of course, should suggest that you shouldn't shovel. It's a safety issue, and the neighborly thing to do. The City of Chicago did not return calls, seeking comment on why the ordinance is so rarely enforced.